Duncan is in a class at co-op this semester called Dialogue with Veterans. It's a fantastic concept. The kids learn about various wars/conflicts in which the U.S. was involved, and then in the next week's session, a veteran from that particular war comes to class and talks with them. 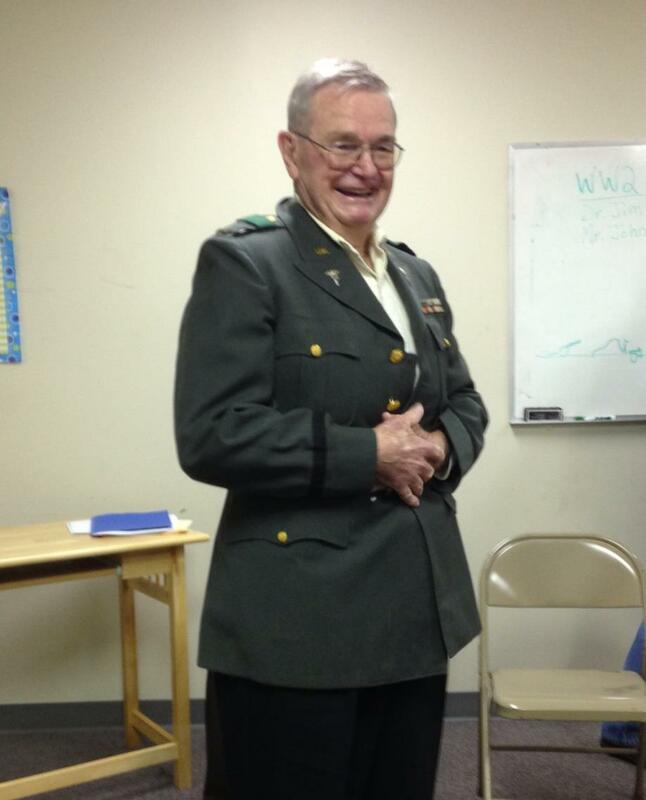 This week's session was World War II, and my Dad was one of the two veterans invited to share their stories. Isn't he handsome? Looking at that photo, one would never guess that he is 88. He likes to joke that his army jacket has shrunk since he last wore it in 1964, but I think the fit is pretty impressive. Dad, who was a forward observer with the 291st Field Artillery, was shipped to France in the fall of 1944. His first action was the Battle of the Bulge. The war in Europe ended, and he went back to the States with a 30-day leave, after which they were to join the upcoming assault on Japan. When he landed in the Boston harbor, newsboys met them on the docks shouting "Second Atomic Bomb Dropped on Japan!" Dad returned then to the University of Illinois. Dad told several stories to the classes (one class was 3rd-5th graders, the other 6th-8th graders), including a couple that I had never heard before. The kids were riveted. The other veteran actually never saw combat; he was about to go to the Pacific when the bombs were dropped on Japan, so he spent the duration of his enlistment in Pearl Harbor after the war.